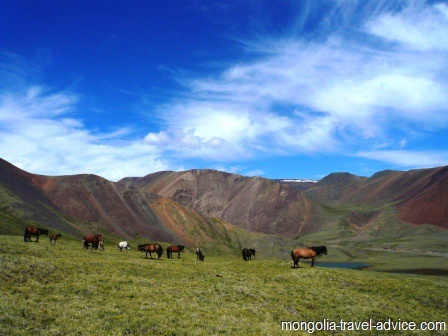 There are four main ranges of Mongolia mountains: the Altai Mountains in Western Mongolia, which turn into the Gobi-Altai mountains as they extend southeast into the Gobi desert. The Khentii mountains lie to the east of Ulan Bator, and the Khangai mountains cover most of central Mongolia. 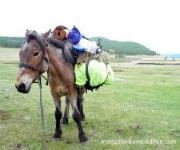 See below for a description of each range of mountains in Mongolia. Obviously the topography directly impacts waterway formation, so after visiting this page you might like to read my page on rivers and lakes in Mongolia. The Khentii mountains (pronounced "Hentii") run north-to-south, and lie just to the east of Ulan Bator. The Khentii mountains in Mongolia form a watershed boundary: off the eastern slopes flow rivers in the Northern Arctic Basin (i.e. via the Selenge river), and off the western slopes flow the Onon and Kherlen rivers all the way to the Pacific Ocean. The Khentii mountains get a lot of rainfall and are the most forested, with quite marshy valleys lying between the hilltops. Genghis Khan was raised along the eastern slopes of the Khentii mountains, and most expeditions (unsuccessfully) searching for his tomb focus their efforts around that area. Genghis was known to pray on mount Burkhan Khaldun ('Burkhan Khaldun Uul', in Mongolian), which lies in the Khentii ranges and is considered the most holy mountain in Mongolia (locals may not welcome tourists climbing it!). East of the Khentii mountains, the topography flattens quickly, forming the great plains of Eastern Mongolia. The Altai mountains span part of Russia, China, Kazakhstan, and Western Mongolia. The Russian portion bordering Mongolia is designated as a UNESCO world heritage site, the 'golden mountains of Altai'. The Altai mountains on the Mongolian side are dominated by the ethnic Kazakh minority, who have their own language, customs, and (Muslim) religion, living quite separate from the (Kalakh) Mongol majority but cut off from their homeland by the imposing mountain ranges. Close to the tri-border with China and Russia lies Khuiten Peak ('Cold Peak', in Mongolian). Khuiten Peak, at 4,370m (14,350 feet), is the highest peak in Mongolia, and is covered in snow year-round. If you ever studied a map of Mongolia and thought, 'geez, it would be so much easier if Kazakhstan actually bordered Mongolia', rest assured that the tri-border area is without roads and can't be crossed on horseback. From the high peaks near the tri-border, the Altai mountains descend gradually down, plateauing at a number of places ideal for hiking, camping, and horse treks. At the Eastern end of the Altais is a relatively low-lying area (but still 1,000m above sea level), called the Great Lakes Depression, which lies between the Altai mountains and the other large range of Central Mongolia mountains -the Khangai. The Great Lakes Depression contains a number of (you guessed it) lakes which are listed on my page on waterways in Mongolia. The Altai mountains contain some rare Mongolian mountain wildlife, such as the wild Argali sheep, the impressive, curve-horned Ibex, and the rare and endangered Snow Leopard (you will be extremely lucky to see one of these). The Gobi-Altai mountains (often spelled 'Govi-Altai mountains') form the south-eastern reaches of the Altai mountains as they extend into the Gobi desert. They remain at over 3,000m high even as they extend their way into one of the world's driest deserts, helping create a 'rain shadow' by blocking rain-bearing clouds reaching the dry Gobi plateau. 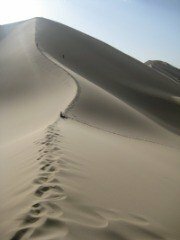 At their eastern-most end, in the South of Mongolia, the mountains act as a barrier to the desert sands carried by winds across the Gobi, forming the formidable Gobi sand dunes. As well as Ibex and Argali sheep, the Gobi-Altai mountains are home to some endangered Gobi bear (a smaller relative of the brown bear) and the somewhat less impressive Gobi-Altai mountain vole, a small rodent that has the appearance of an overweight rat, if not a little bit more cute. The Khangai Mountains (pronounced "Hangai")cover the largest area of any Mongolia mountains, sprawling across most of Central and Northern Mongolia. Out of the Khangai mountains spring most of Mongolia's largest rivers, which flow north-east into the Arctic river basin: the Ider (i.e. Selenge), Orkhon, Zavkhan and Delgermoron among them. The Ider-Selenge system is the world's 5th-longest river system, and starts as a little trickle on one of the Khangai's remote peaks. To the south the Khangai mountains drop off into the Gobi desert, and to the west lies the Darkhad Depression. 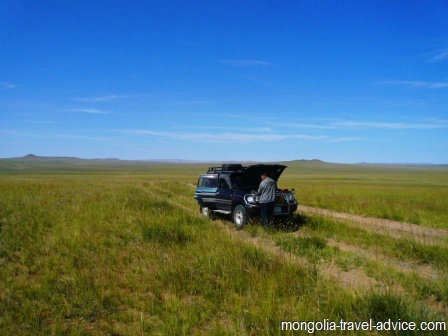 Much of the Khangai mountains are the gentle, rolling mountains punctuating the grassy Mongolian steppe -so typical of tourist photos of Mongolia. 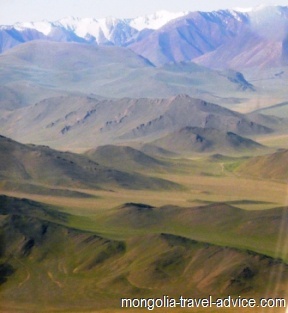 But some of the Khangai peaks are among the highest mountains in Mongolia. One of these is Otgon Tenger Uul, which is just on 4,000m and one of the more sacred of Mongolia mountains. Locals don't like Westerners climbing the mountain itself, but the surrounding area is beautiful and is protected as a national park. 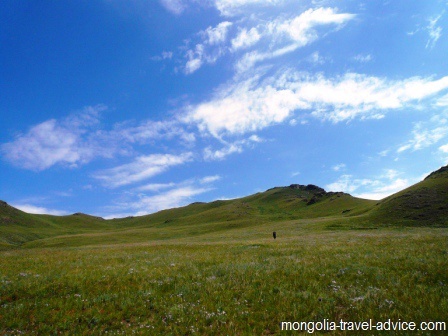 Because the Khangai mountains surround Karakorum and are in relative proximity to Ulan Bator they are the most popular Mongolia mountains for tourists. They contain a number of lakes and ger camps which form popular tourist attractions, but have reaches rugged and remote enough to please the most adventurous traveler.